Vogtland, has focused on providing premium quality aftermarket high performance suspension, OE automotive and industrial springs. Their engineers and technicians are car enthusiasts just like you. They test and develop each and every application with the driving enthusiast in mind. This is why they offer spring and suspension kits that provide the "look" and performance you would expect from a premium brand like Vogtland. Quality is an integral part of Vogtland's culture, they are certified to DIN EN ISO 9001 standards which are supported internally by engineering, testing capabilities, and training programs to maintain the highest quality assurance standards. Manufacturing for companies like Koni, Tokico, Sachs, Lorinser, and TC Kline Racing keep Vogtland at the forefront of technology. To ensure years of useful service, all Vogtland suspension springs are manufactured by utilizing only the finest suspension grade spring alloys on sophisticated CNC controlled Wafios spring coiling machines. After the cold coiling process, all suspension springs are tempered, shot peened and preset to ensure consistent vehicle ride height and suspension function. Finally the springs are phosphate and powder coated to ensure a superior corrosion barrier for years of service. Vogtland doesn't volunteer their spring rates. They are great on the street and for occasional track duty. For someone who tracks often or the experienced racer this kit may be just a tiny bit on the soft side. It's a great dual purpose kit for the right person. All of Vogtland's our complete kits are course adjusted to an optimum setting and their top-class components are finely tuned by VOGTLAND engineers. 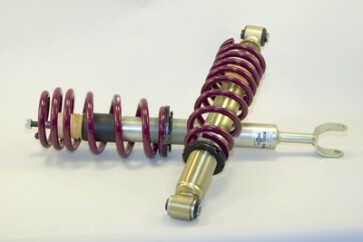 The shock absorber characteristics and spring rates in particular have been mutually optimized in tough, practical tests. NOTE: Be sure to specify whether or not your A6 is quattro (all wheel drive) using the dropdown below. - 1.2" to 2.5", adjustable at each corner.